And Google. And Microsoft. And Home Depot. Eric Chemi, head of research for Bloomberg Businessweek, pulls an amazing stat. 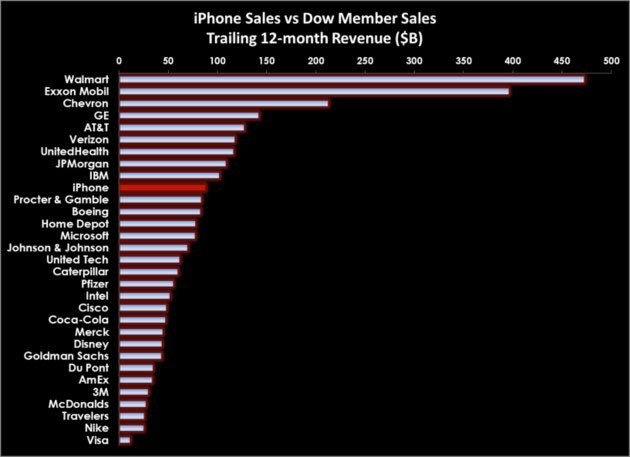 iPhone sales in the last year exceed all revenue to Microsoft, Amazon, Comcast, or Google. 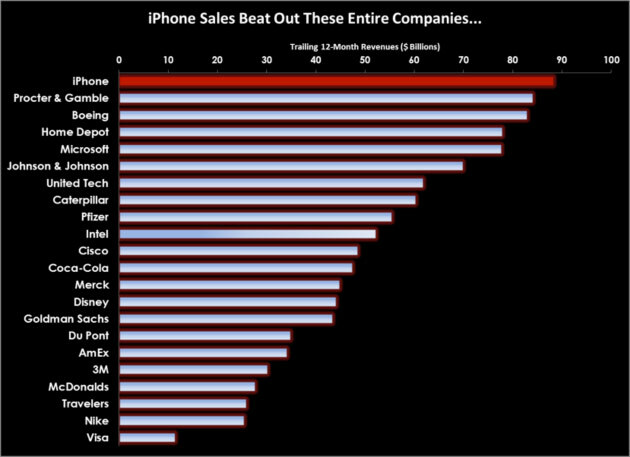 The iPhone alone outsells Coca-Cola and McDonald's, perhaps the world's two most famous brands, combined. Put differently, but no less dramatically, a product that did not exist in May 2007 is now a bigger business than 474 companies in the S&P 500. So there you have it. Apple is "dead money" in the words of one investor, and I don't know enough about the future to tell you he's wrong. But let's pause for a moment during the funeral procession to observe that the iPhone could be the most successful branded product in the history of the world, and that's something amazing to behold, no matter what direction the company's stock is headed this afternoon. Update: The link in the first sentence, which originally pointed to the author's email address, has been edited to direct you to the original Businessweek link.